Wolf OR-7, also known as Journey, has been a leader in the return of his species to Southern Oregon and California. 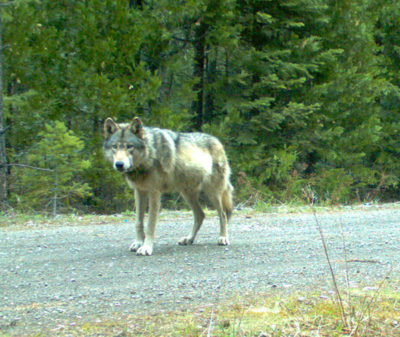 He left his natal pack in 2011 and dispersed southward, eventually finding a mate and settling in the area of the Rogue-River Siskiyou National Forest. The Rogue pack, as his family group is called, have produced five litters of pups so far. Other wolves have followed Journey’s trek from Northeastern Oregon to our part of the state, helping to increase population numbers as well as genetic diversity. What conditions allow for these long and difficult dispersals to occur? And what issues do we face now that wolves are on the landscape? This talk will be a discussion about these and other wolf-related topics. Please come with questions and comments. Beckie Elgin, among many other things, is a free-lance writer. Her book, Journey: The Amazing Story of OR-7, the Oregon Wolf that Made History, was released last year. This book tells the story of Journey, our very own wandering wolf, who traveled thousands of miles before making Southern Oregon his home. Beckie’s publications include: Wild Hope, Earth Island Journal, The Oregonian, Tusculum Review, Litro, The Bark, and others. She and her very energetic German Shepherd Dog live outside of Jacksonville, Oregon. Beckie loves conversing about wolves and hiking into the mountains to search for tracks, and perhaps even see a wolf!